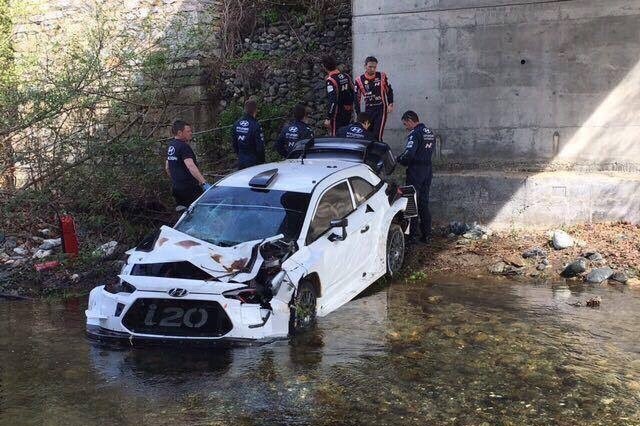 Thierry Neuville has crashed his Hyundai i20 WRC into a river during testing for next week’s Tour de Corse. Neuville was conducting running on the French island of Corsica, which will host Round 4 of the World Rally Championship, when he left the road approaching to a bridge. According to WRC.com, the accident occurred at the exit of a left-hand corner where the Belgian slid off the road and dropped more than five metres into a shallow section of the river. While the car incurred significant front and rear damage, Hyundai has confirmed that neither Neuville nor co-driver Nicolas Gilsoul were injured. Team-mates Andreas Mikkelsen and Dani Sordo had already conducted their pre-Corse testing. Sordo will be piloting the #6 i20 for the second of four rallies in a row before Hayden Paddon is back behind the wheel for Rally Italy in June. Neuville is second in the championship, which resumes on April 5-8.